9pm: Arrival to Amilcingo and delegate registration begins at this Sharing site. FIRST SHARINGS IN SAN FRANCISCO XOCHICUAUTLA AND AMICINGO. San Francisco Xochicuautla, Municipality of Lerma, Mexico State. 9pm: the Sharing work begins. 3pm: the Sharing work continues. 9am: the Sharing work begins. 7pm: the Sharing work ends. Amilcingo, Muncipality of Temoac, Morelos. 9am: Welcome by compañeros from Amilcingo. 9:30am: the Sharing work begins. 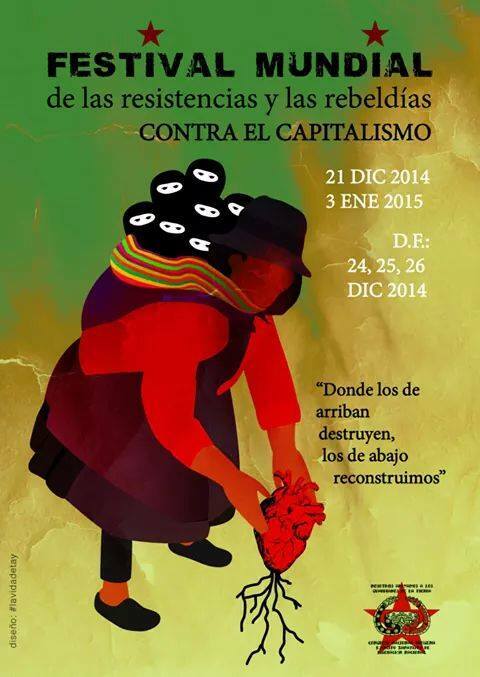 Great Cultural Festival in the Federal District, December 24, 25, 26, 2014. Lienzo Charro, Cabeza de Juárez. Av. Guelatao, No. 50, Colonia Álvaro Obregón. Delegación Iztapalapa. December 27, 2014. Delegates of the CNI and the Sixth depart for the next Sharing in Candelaria, Campeche. Third Sharing. Monclova, Municipality of Candelaria, Campeche. 4pm: Registration begins for all of the delegates in Monclova. 9am: Welcome by the compañeros from the Peninsula. 9:30 am: The Sharing work begins. 12 pm: Recess and pozol. 12:30 pm: the Sharing work continues. 5 pm: the Sharing work continues. 9 am: the Sharing work begins. 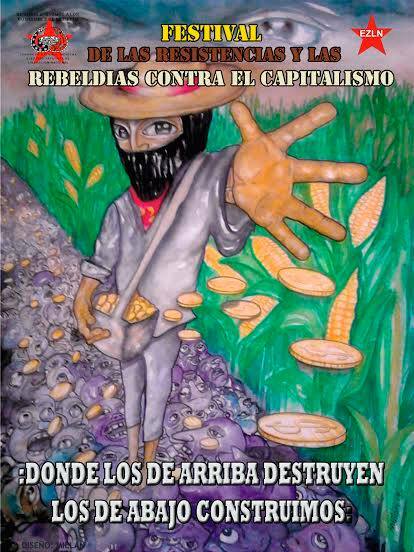 Celebration of Anti-capitalist Rebellion and Resistance in the Caracol of Oventic, Chiapas. December 31, 2014 and January 1, 2015. PLENARY SESSION FOR CONCLUSIONS, AGREEMENTS, AND DECLARATIONS. CIDECI, SAN CRISTÓBAL DE LAS CASAS, CHIAPAS. Summary reports from each Sharing. Agreements and tasks to be carried out. The peoples, communities, and organizations who belong to the CNI. Adherents to the National and International Sixth. Local and regional indigenous peoples, communities, and organizations invited by the Sharing sites in agreement with the Provisional Coordination of the CNI. 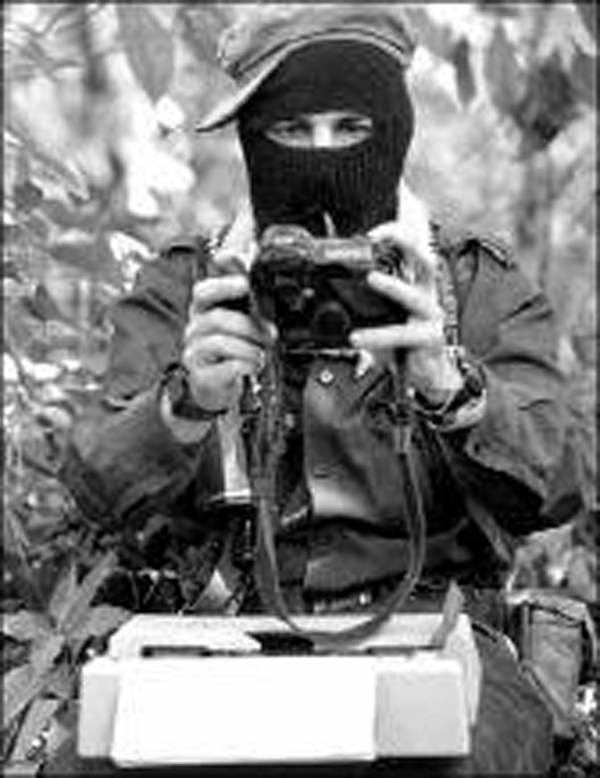 Social organizations in resistance invited by the National Indigenous Congress and the Zapatista Army for National Liberation. The free and alternative media that are adherents to the Sixth. Registration of delegates will be handled by a SINGLE REGISTRATION COMMISSION composed of the Provisional Coordination of the CNI, delegates from each of the Sharing sites, and a commission from the National Sixth. Delegates from the National Indigenous Congress can register by sending an email tocatedratatajuan@gmail.com prior to December 15, 2014. Registration information should include the names of the delegates, the people they belong to (their language), their community or organization, and their municipality and state. ALSO INDICATE WHICH PARTS OF THE FESTIVAL YOU WILL PARTICIPATE IN OR IF YOU WILL PARTICIPATE IN THE ENTIRE EVENT. Delegates from the National and International Sixth and the alternative and free media can register by sending an email to comparticionsexta@gmail.com prior to December 15, 2014. Registration information should include the names of the delegates, their organization and/or collective or status as an individual participant, and their state and country. ALSO INDICATE WHICH PARTS OF THE FESTIVAL YOU WILL PARTICIPATE IN OR IF YOU WILL PARTICIPATE IN THE ENTIRE EVENT. Invited delegates can register by sending an email to catedratatajuan@gmail.com, or directly at the Sharing sites during the times stipulated in the Festival Program. The people, communities, and organizations that are members of the CNI and the Sixth and who wish to hold a cultural event or sell products in the Great Cultural Festival in the Federal District should send all necessary information to comparticioncultural@gmail.com.